For thousands of years, bees have been building their own hives and making honey for their own enjoyment and survival. For thousands of years, people have been trying different ways to create hives that will entice the bees to settle where their products can be shared. Different styles of hives have been tried with varying degrees of success. Since the discovery of the phenomenon of bee space by the Reverend Lorenzo Lorraine Langstroth, in 1851, and the subsequent development of hives that take advantage of the space where bees neither build comb nor fill the space with propolis, Langstroth hives have become the standard. The Apimaye 10 Frame Langstroth Insulated Beehive offers significant refinements to the Langstroth hive. What Is The Apimaye 10 Frame Langstroth Insulated Beehive? The Apimaye 10 Frame Langstroth Insulated Beehive is a standard beehive in the Langstroth style. Made of high-quality, food-grade, UV-resistant plastic, this hive has a distinctly modern appearance. The hive is well-sealed, well-insulated, and well-ventilated, creating an environment where many of the risk factors affecting bees are greatly reduced. 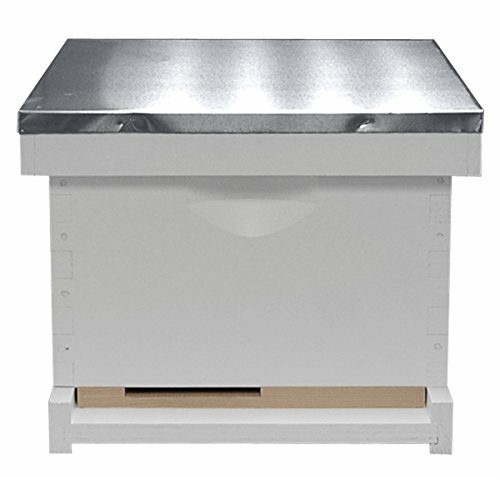 The Apimaye 10 Frame Langstroth Insulated Beehive comes with several standard features that either aren't available on most other hives or must be added to the hive. These include a screened bottom board with pollen trap and drawer, a queen excluder, top feeder, entrance reducer, uniting/division board, and frame spacers. This hive includes 20 plastic frames (Handy frames), but it doesn't include any foundation. The handy frames are designed for wax foundation only. The top cover feeder allows the beekeeper to feed the bees candy or syrup without opening the hive. The mechanism works in such a way that it prevents the bees from drowning in the syrup that is poured in. The uniting/division board is used to change the hive as needed for various reasons, The board is inserted in the hive in such a way that it cuts off one part from the other. Removing the board has the opposite effect of opening up the sections and allowing the bees to move freely again. The prices of the beehive kits we are comparing range from around $118 to around $350. The four hive products are all available on Amazon.com. The price of the Apimaye 10 Frame Langstroth Insulated Beehive is around three hundred and fifty dollars. It is the most expensive of the four hives we are reviewing. The company is quick to point out that paying more at the beginning for something that will last longer and serve the beekeeper better is a wise investment. Some additional features that come as part of the Apimaye 10 Frame Langstroth Insulated Beehive must be purchased separately for other hives. The value of these features is estimated at around a hundred and thirty. It's definitely easy to get started with the Apimaye 10 Frame Langstroth Insulated Beehive. But, managing the hive is also easy because of the concern for building a hive that has the least impact possible on the bees. Not by coincidence, what makes life in the hive easier for the bees also makes life easier for the beekeeper. This hive gives the beekeeper easy access to the hive so observing, moving things in the hive and harvesting honey all can be done with as little disturbance of the bees as possible. The Apimaye 10 Frame Langstroth Insulated Beehive has been designed to be easy on the bees by making it easy for the beekeeper to check on the bees, move them and harvest honey. Its insulation is also designed to promote the strengthening of the colony. By reducing the impact of weather extremes on the hive, the bees are healthier and more productive. Because the Apimaye 10 Frame Langstroth Insulated Beehive is so well-sealed and watertight, the bees can focus on making honey and not be busy patching up cracks in the hive with propolis. 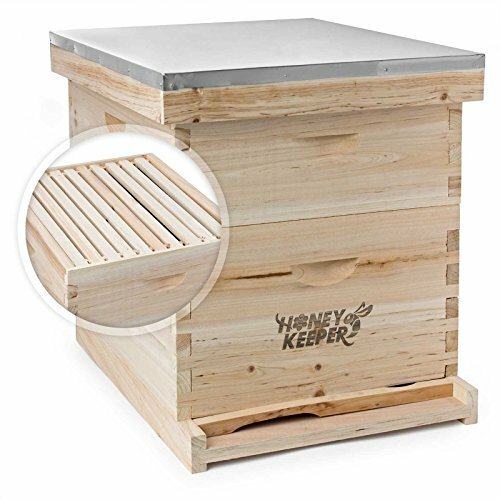 The appearance of the Apimaye 10 Frame Langstroth Insulated Beehive stands out in an industry where many apiaries have a variety of painted wood boxes added to the hive at different times over an extended period. The Apimaye 10 Frame Langstroth Insulated Beehive has a different look completely, almost toy-like. The Mann Lake 10-Frame Bee Hive Kit includes the assembled and painted hive body and 10 assembled frames with Mann Lake's proprietary Rite Cell yellow waxed foundation. The telescopic roof has an inner cover and comes assembled and painted. The painted bottom board has a reducer, used to help the beekeeper control traffic into and out of the hive. This hive makes an excellent starter unit. A second deep hive box can easily be added as the bee colony grows. The price of this 10-Frame Bee Hive Kit is around almost a hundred and twenty. This kit arrives ready for action. It is assembled and painted and the frames have the highly regarded Rite Cell yellow waxed foundation. Made of quality pine, assembled and painted, with a complete cover and bottom board, this hive is a good starter unit that can be added onto with matching super boxes as the operation grows. Or, it can be added to existing beehive boxes to accommodate growth. Some users have experienced paint peeling off the bottom board, which is solid and not screened, and others report issues with moisture affecting it. 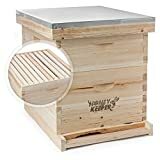 The Honey Keeper Beehive 20 Frame Complete Box Kit (10 Deep and 10 Medium) with Metal Roof for Langstroth Beekeeping is a 20-frame hive that comes as a kit, ready to assemble. One box has 10 deep frames, and the other has 10 medium frames. The kit includes a queen excluder, inner cover, solid bottom board and entrance reducer. It has a pre-assembled galvanized metal telescoping roof for weather protection. The foundation is built with premium fir and the frames are white pine. The pre-cut frame foundations are unwaxed and have hexagon-shaped surfaces. The kit weighs just under 47 pounds. This Honey Keeper Beehive is priced at around a hundred and forty which is an excellent price for such a complete kit. This hive requires assembly and painting. The frames are not waxed which some beekeepers find objectionable. Once it is complete, this is an efficient unit that can be expanded with the addition of beehive boxes or supers. Ease of assembly depends on the skills of the assembler. One beekeeper reported building one of the boxes in two hours. Another praised this kit and said it took him 15 minutes to put it together. Some people have replaced the nails that come with the kit with screws and other fasteners. Others have reinforced the joints with glue. This is a more complete beehive kit compared to others on the market that are just one box with a roof. 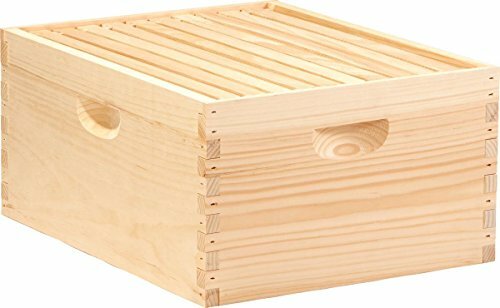 The Little Giant Farm & Ag HIVE10KIT 10-Frame Beginner Hive Kit is a complete hive box with 10 medium frames in the Langstroth style. This kit comes assembled. It is made of unfinished pine, but it is ready to paint or finish. The frames have pre-installed wax-coated black foundation. 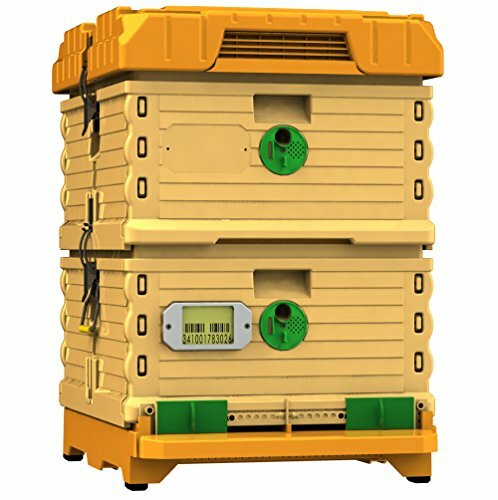 The hive boxes are suitable to be used as either a brood box or as a honey super. This kit is especially intended for the beginner and comes with essential accessories to get started: gloves, veil, smoker, smoker fuel, bee brush, hive tool, and a frame feeder. The box is suitable to add to an existing hive, but an established beekeeper probably would want to purchase just the hive box separately. The price of the Little Giant Farm & Ag HIVE10KIT 10-Frame Beginner Hive Kit is around two hundred seventeen. This price includes the 10 frame hive box plus a list of accessories the beekeeper will need to get started. Since this kit comes assembled, all that is needed to get started is to paint or apply a weatherproof finish. The concept of the kit bundled with essential accessories is an attractive one, especially if it is being purchased as a gift. The accessories come from different manufacturers, which makes it difficult to follow up if something is defective. There have been some reports about quality issues and problems with the condition of the hive box upon arrival. The four hives we reviewed are quality products that offer distinct advantages that will appeal to beekeepers. The Little Giant Farm & Ag Kit is one that would make a great gift for someone who wants to take up beekeeping. But, established beekeepers will already have the accessories and just want the pieces they need to keep building their hives. The Honey Keeper Beehive is a true kit that requires the beekeeper to assemble the hive. Many beekeepers enjoy this kind of project for the sheer pleasure of it, and others like to save some money by doing it themselves. Priced at around $140, this hive does have a 20 frame capacity and 20 frames, which makes it a good value. But, it is not a lot less expensive than the Mann Lake hive that comes fully painted and assembled for around $118. Adding a super to the Mann Lake model would make it similar in capacity for only a little more expense. For someone serious about starting to keep bees or for the beekeeper who wants to add a high quality hive to expand the operation, the Apimaye 10 Frame Langstroth Insulated Beehive offers many advantages. With its excellent design, insulation, and ventilation and the extra features that are built-in, many of the risks to the health, well-being and productivity of the bees are eliminated or minimized. Over time, maybe even a short time, those advantages will pay for themselves. Integrating the Apimaye 10 Frame Langstroth Insulated Beehive into an existing apiary may be a leap because it has a very different look from the wooden boxes we are used to seeing. But starting with this unit makes a lot of sense. Once it arrives, it's ready for bees. 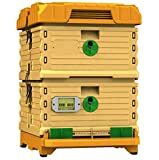 We give the Apimaye 10 Frame Langstroth Insulated Beehive 5 stars on a 5-star rating system for its excellent quality, well-thought out design, and innovative features.